EagleVail’s Mikaela Shiffrin charged hard in a World Cup super-G in Cortina, Italy, on Sunday to take her 11th win of the season, third super-G and 54th overall career victory. The 23-year-old is just one win short of tying Switzerland’s Vreni Schneider for third on the all-time women’s victory list and three short of tying Schneider’s single-season record of 14 wins. Shiffrin, who did not race in either downhill race in Cortina on Friday or Saturday, built her overall World Cup lead to nearly 600 points over second-place Petra Vlhova of Slovakia, who did not race on Sunday. Vail’s Lindsey Vonn, in her first action this season since returning from a training-run knee injury at Copper Mountain, finished 15th in Friday’s downhill, 9th in Saturday’s downhill and was a DNF on Sunday, although she skied off on her own power and appears to be OK.
On a perfect sun-splashed course in the Italian Alps, Mikaela Shiffrin (Avon, Colo.) trusted her instincts and equipment and came away with another FIS Ski World Cup victory in super-G Sunday in Cortina d’Ampezzo. Starting 17th with the red World Cup leader’s bib, Shiffrin, who also leads the World Cup super-G standings, watched a few competitors before her, including teammate Lindsey Vonn (Vail, Colo.), struggle on the Olympia delle Tofane course. After inspecting the course, Shiffrin admitted she was a bit nervous, but all that disappeared once she was in the start. Unlike most athletes who raced in Sunday’s super-G, Shiffrin did not ski either of the downhill training runs or the downhills at the venue, which can be a more challenging way to head into a super-G race. But for Shiffrin – who had a solid day of super-G training in Sarntal, Italy prior to arriving to Cortina – it was no problem. Tina Weirather of Liechtenstein was second, followed by Tamara Tippler of Austria in third. 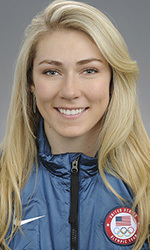 Laurenne Ross (Bend, Ore.) was 23rd. Vonn and Alice Merryweather (Hingham, Mass.) were among the 22 athletes who did not finish, but both skied away and are OK. Vonn was making up time as she skied down the track, but got pulled pretty low and couldn’t make the next left footer, crossing her arms in front of her and skiing through the panel. “I haven’t quite processed everything yet,” an emotional Vonn said after her DNF. “I can’t seem to stop crying. It’s been a lot of great memories here in Cortina. I tried to really ski my best, I tried to come through the finish and make a good result for the fans here, but I didn’t quite do that. With the victory, Shiffrin extended her overall World Cup lead to 596 points over Slovakia’s Petra Vlhova, who did not race Sunday. Shiffrin also leads the World Cup super-G, giant slalom, and slalom standings. Shiffrin is now tied with legendary Austrian skier Hermann Maier with 54 victories, sitting sixth place all-time among men and women. She needs just two more victories in order to pass Vreni Schneider (55) in fifth place. Up next, the women’s World Cup tour moves on to Garmisch-Partenkirchen, Germany for downhill and super-G races Jan. 24-25. As for Vonn, her comeback to the World Cup circuit this weekend in Cortina, where she has won 12 races (six downhill and six super-G) over her 18-year career, hasn’t been what she expected, despite 15th and ninth-place results in Friday and Saturday’s downhills, respectively. All streams are available via desktop (NBCSports.com/Live, NBCSports.com/GoldandOlympicChannel.com) as well as mobile, tablet and connected television platforms. The NBC Sports app, NBC Sports Gold app and Olympic Channel app are available on the iTunes App Store, Google Play, Windows Store, Roku Channel Store, Apple TV and Amazon Fire. Exclusive commercial-free coverage will be available for subscribers of the NBC Sports Gold Pass.